With three new Affinity Sphere Directors just named, Capitol Ministries has successfully planted men in 7 of the globe’s 10 strategic geographical regions who will spread the Gospel of Jesus Christ to the political leaders of nations in their areas of the world. 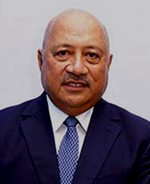 Inoke Kubuabola, a leading Fiji Parliamentarian, has just been appointed Capitol Ministries’ Affinity Sphere Director for the 16 South Pacific island nations. Earlier this year Oscar Zamora was named Affinity Sphere Director for Latin America. And Samuel Mitrofan was named Affinity Sphere Director for Western Europe and Balkan nations. Jon Cassel, French- Portuguese- and Spanish-speaking African countries. A primary mission of Capitol Ministries is to develop 200 ministries in 200 foreign federal capitals around the world. To achieve these international goals, CM has divided the globe into 10 Affinity Spheres and has sought godly men as Directors who have the experience, qualifications, connections, and motivation to establish ministries in their regions. Each Director is charged with finding, training, and mentoring Ministry Leaders who are Bible teachers with the hearts of evangelists to take the Gospel to political leaders in each nation in his geographical area. Capitol Ministries is seeking leaders for the two remaining unstaffed Affinity Spheres of Asia and the Caribbean. The appointments are the most recent development in a period of high growth that Capitol Ministries has experienced recently. Earlier this year Ralph Drollinger, President and Founder of Capitol Ministries, began teaching a Bible study to members of President Donald Trump’s White House Cabinet. The first such study in recent memory, it is currently sponsored by nine Cabinet Members. Drollinger also teaches separate Bible studies to members of the U.S. Senate and The House of Representatives. “The fact that God has allowed me to lead the White House Cabinet Member Bible study affords Capitol Ministries tremendous credibility worldwide in terms of starting in-depth Bible teaching/discipleship ministries in foreign federal Capitols,” Drollinger said. If you or someone you know is interested in learning more about ministry leadership in Asia or the Caribbean, please review our Ministry Leader brochure online. Rather than a self-help book of steps on how to be successful in this world, this profound book shows how we are certain we can be successful in the next. It illustrates though examples how we may know on the day of judgment that we have lived a life that is pleasing to God. Proverbs addresses personal morality, duty, ethics, and values and virtues that inform and instruct exactly what God’s will is, even concerning the most complex matters of life! It clarifies what exactly righteousness looks like – and is – in given situations. Mastering the Fascinating Book of Proverbs is the Bible study that Ralph Drollinger will teach to Members of the White House Cabinet, U.S. Senators and Representatives in Washington, D.C. this week. We invite you to read this study, along with the leaders of our nation, and learn how a life-long study of Proverbs will help mold, reinforce, and strengthen the resolve of every person’s conscience. Click to read Mastering the Fascinating Book of Proverbs.